Imagine the convenience of selecting TV channels using your remote and then pointing the same remote to your switchboard to switch on/off the fan or the tube light. Here is a simple circuit to remotely switch on/off any electrical device through a relay using the normal TV/ VCR/VCP/VCD remote control unit. It works up to a distance of about 10 metres. The output pin of IR sensor goes low when it detects IR light, triggering the monostable (1-second) built around timer NE555. The output of the mono toggles the J-K flip flop, whose Q output drives the relay through SL100 npn transistor (T1). LED2, LED3, and LED4 are used to display the status of each output stage during circuit operation. Back-EMF diode D5 is used for protection. Transistor T1 is configured as an open-collector output device to drive the relay rated at 12V DC. 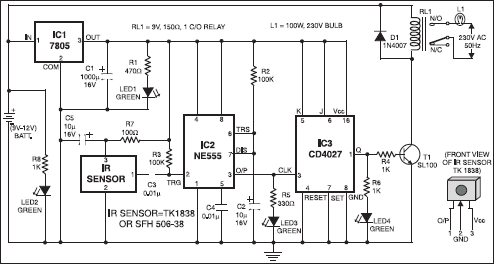 The circuit draws the power from voltage regulator 7805. Capacitor C5 is soldered close to the IR sensor’s pins to avoid noise and false triggering. Capacitor C3 and resistor R3 also avoid false triggering of monostable NE555. The monostable acts as a 1-second hysterisis unit to restrict the flipflop from getting retriggered within one second. To activate any other 12V logic device, use the output across the relay coil terminals. Your feedback is very important for us. Kindly Send Your Feedback Here.